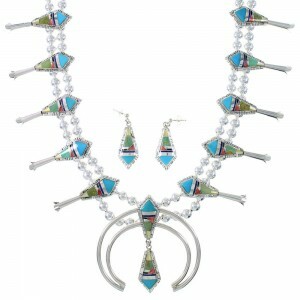 The squash blossom necklace is one of the most distinctive and beautiful designs in Native American jewelry. 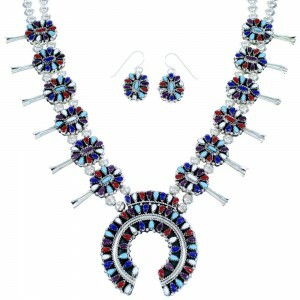 At SilverTribe, we have an amazing selection of the most detailed and elegant squash blossom necklaces on the market. 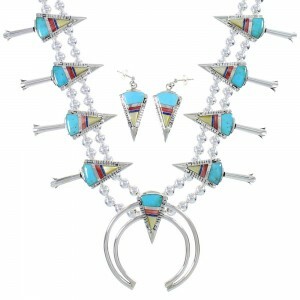 Navajo silversmiths first made these dazzling necklaces in the 19th century, when members of the tribe were introduced to the craft of metalworking. The origin of the term squash blossom necklace remains a mystery to this day as both the Navajo and Pueblo tribes use the description in their respective languages. Many historians however, believe it was a mistranslation that stuck. 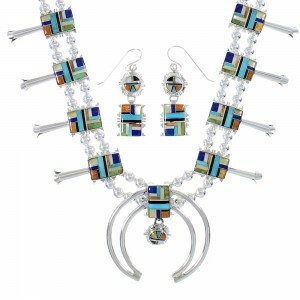 While the Navajo squash blossom necklace is among the more celebrated varieties, Zuni and Pueblo artists also make outstanding examples of this popular item. All Southwest tribes use a similar style and stones, but there are differences that make each tribe's interpretation unique. 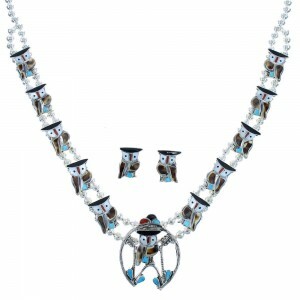 Traditionally, full-sized squash blossom necklaces are large and intricately detailed. These were used for special ceremonial occasions. Today, customers of all backgrounds and influences wear large squash blossom necklaces for various formal or special occasions, such as a wedding or graduation. Smaller, lighter squash blossom necklaces are perfect for any day of the week and we have a great selection of styles that will suit any occasion and turn plenty of heads. 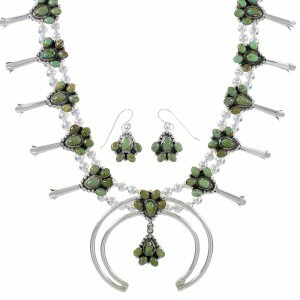 There are several features that make a squash blossom necklace unique. The crescent-shaped pendant on the end is known as the naja. The naja pendant is often adorned with stones and made with impeccable detail. The "blossoms" are usually made of sterling silver and look like flower pedals. They are sometimes adorned with stones. Many experts believe the pedals more closely resemble pomegranate blossoms, which were popular with Spanish jewelry at the time. Some people believe the naja pendant was inspired by the iron horse bridal designs of Spanish Conquistadors. 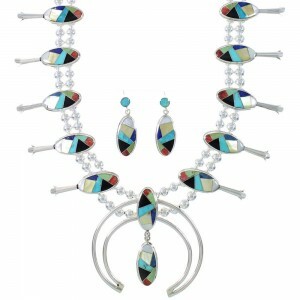 The ornaments were traded to American Indians and used as adornment, primarily worn around the neck. 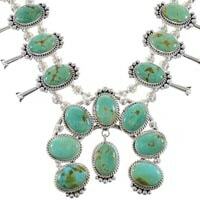 Over the years, the designs became more elaborate, leading to the beautiful squash blossom necklaces we see today. 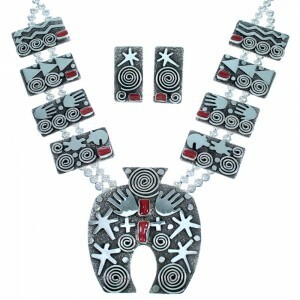 The early examples featured basic silver naja pendants. 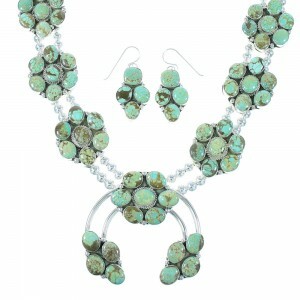 As the craft advanced, artists became more skilled with silver working and incorporated elaborate designs into the naja using turquoise and other beautiful stones. Another distinguishing feature found on a squash blossom necklace are sterling silver beads. 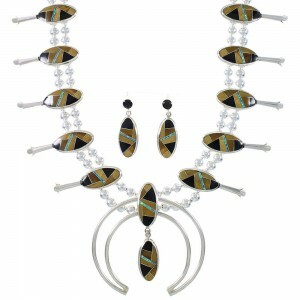 These beads are typically round; they are handmade, wrought into spheres and hand soldered to form the necklace. 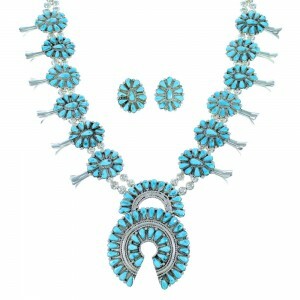 The squash blossom necklace is not attributed to one single tribe. 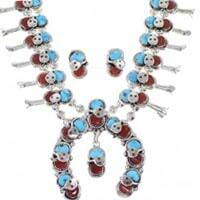 In fact, the Navajo, Pueblo, Zuni and Hopi all played a role in the evolution of the style. 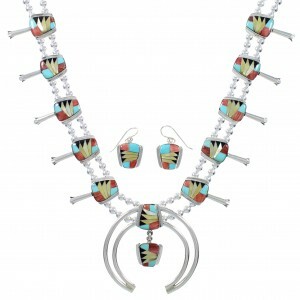 We carry a fantastic selection of handmade and hand-strung turquoise squash blossom necklaces from some of the most respected American Indian artists in the Southwest. We only carry the highest quality necklaces available. But the mystery is undoubtedly part of the appeal. 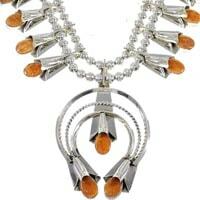 People choose our squash blossom necklaces because of the beauty and craftsmanship of our pieces. 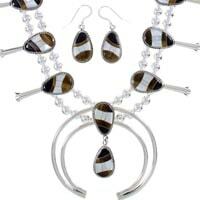 Our artists make some of the most alluring examples to fit any budget. Take some time to explore our vast selection of squash blossom necklaces designed by some of the most skilled artists in the field. 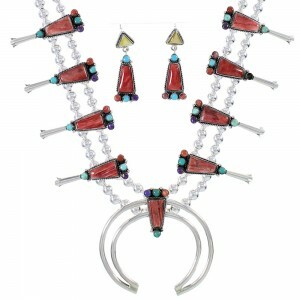 We carry hand-made Navajo designs with red coral beads placed in a stunning sterling silver setting. 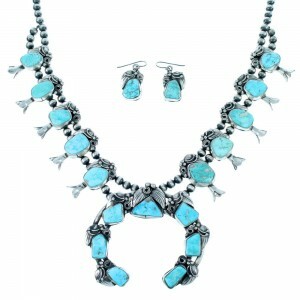 We also carry old pawn style items featuring Sleeping Beauty Turquoise and genuine sterling silver. The stones are placed in hand-cut bezel settings to ensure the highest quality on the market. 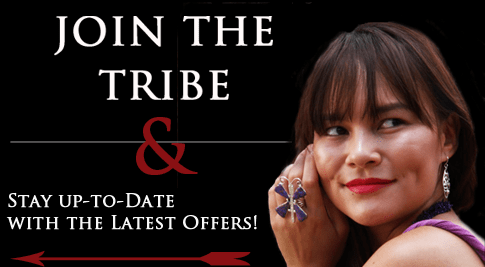 We are always marking down prices and offering huge discounts on our Native American Necklace products. 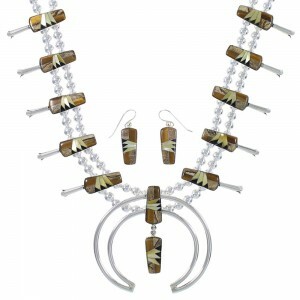 At SilverTribe, you can browse through the highest quality hand-made squash blossom necklaces on the market. Every one we carry is a work of art crafted to the highest standards to ensure your purchase will look beautiful for generations to come.